As a large crowd gathered in Oklahoma City, 17 horse-and-rider teams entered the Jim Norick Arena in hopes of taking home a share of the $53,891 purse in the Junior Cutting at the American Quarter Horse Association (AQHA) World Championship Show. 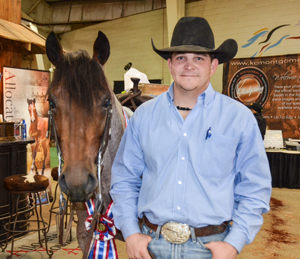 When it was all said and done, Cody Hedlund and Meteles Cat’s score of 221 won the Junior Cutting World Championship. Drawing up 15th in the working order left the Wilton, California, rider with plenty of time to watch the competition. Meteles Cat (Metallic Cat x Teles Lies x Lenas Telesis) has had quite the success under the saddle of Cody and his father, Rock, who bred the horse. Meteles Cat has lifetime earnings of $111,279, and is currently in a battle for the 2014 NCHA Non-Pro Horse of the Year title.